The Mtn. 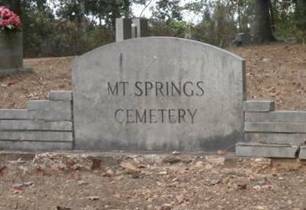 Springs cemetery is located on Mt. Mills Rd., county road #33 south of Barton, Alabama. Turn south on Mt. Mills Rd. just east of the convenience store, & travel approximately 6.3 miles. The cemetery is on the left. There are numerous unidentifiable graves here due to it being an old cemetery. Aldridge, Annie L.; b. 25 Nov 1899, d. 28 Dec 1976, wife of W.L. Huskey, Malinda; b. 16 Apr 1879, d. 27 Feb 1952, wife of Henry T.
Swader, Azlee; b. 18 Feb 1925, only date, wife of Clarence B.
Watson, Sairatt H.; b. 1818, d. 1885, wife of John Sr.